Well, that was. . . unexpected. We all thought Hope was such a nice girl; a bit rebellious, perhaps. I’d never thought she’d do this. I mean, kidnapping her own [spoiler]? What a witch! Last night’s episode of The Originals was surprising, to say the least, but still fell short of the shock and awe we’re used to. Where are all the weird and wacky twists and turns, people? There was only two or three in this episode. That’s not enough. We need more of that and less of this “end of the world,” “we have to stay away from each other” stuff. It’s getting old, am I right? The Original writers need to bring back all that Klaus and Elijah interplay we love so much. They need to bring back plot lines that actually keep us on the edge of our seat, instead of story lines that make us yawn. We need shock and snark and we need it now. Go on, Original writers. Get to it. We’re waiting. In the meantime, I’ll recap the episode. Warning! There are SPOILERS ahead. Ah, teenage angst. I remember it well. Sitting in a dark room and listening to music, while remembering emotionally traumatic events? It’s just another day in the life of a Mikaelson with daddy issues. Hope, a tad forlorn, looks back on days gone by, days when she was desperate to see her father. He hadn’t been gone that long, but she still wanted to see him, to look in his eyes and know everything was going to be all right. The talented, young witch was strong; knowing exactly the right spell to grant her wish. Using astral projection, Hope brings her world to his, his view to her. However, her dream quickly turned into an overwhelming nightmare. Hope’s timing was off. She had interrupted Klaus during working hours. Ripping out hearts was a dirty job, but someone had to do it. Klaus, covered in blood, yelled at Hope. “Get out!” He did not want her to see him like that. Now, she should know better. She should know Klaus was not the man he seemed to be. Yet, it still surprises her to see him flee her presence. He can’t stay, of course. The dark magic that resides inside him, that yearns to live in Hope, threatens their very existence. Klaus briefly meets with Freya, but their reunion is for informational purposes only. She scolds him for his rendezvous with Elijah and proceeds to tell him about Hayley’s disappearance. Since nobody knows where she is, his options are limited. First stop, Marcel. Klaus needs his help to interrogate the Crescent wolves. Next, a quick convo with Hayley’s new human boy-toy, Declan. He has to know something, right? Oh, look! A teenage vampire is stalking Hope. “You know I’m a vampire, right? So I, uh, kind of need you to say it out loud.” Whoa, I’m having Twilight flashbacks. Roman, a fellow school chum, has decided to check up on Hope after hearing about Henry’s “death.” His guilt, which is just eating him alive, brings him to Hope’s door. She sets the record straight, but leaves quickly. She has somewhere to be. After threatening to maim Declan and realizing he is more to Hope than just a friend of her mom, Klaus breaks out his fangs. The kid is getting on his nerves. Sadly, Hope is there to rescue the human. With her witchy ways, Hope flings Klaus across the room. How dare Klaus threaten this guy, this pseudo father figure. Like, seriously, Dad? Hope begs her father to let her help find Hayley. However, it is taking all of Klaus’ strength not to turn *mustache twirl* EVIL. He can hear the whispers. They want him to do bad, bad things. 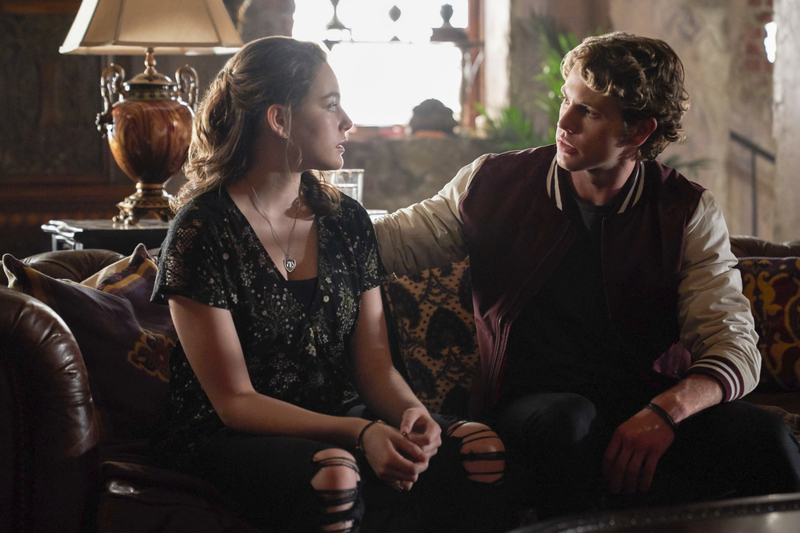 Klaus, rather comically, threatens to ground Hope – by making Freya bind Hope to the compound with a spell – if she doesn’t stop this nonsense and goes home immediately. She relents, but she isn’t happy about it. Meanwhile, the vampires of New Orleans are getting restless. They still don’t know the identity of Poppy’s killer and are unsure of Marcel’s motives. The King smells mutiny among his ranks. He assures his friends that Poppy’s death will be avenged and the evildoer be punished, but the vamps are unconvinced. Marcel is a hybrid. How can he be King? How can he be trusted again? Marcel does everything in his power to give them peace of mind. He leads his disciples to the bayou, to the Crescent wolves. He demands answers. He needs to know why they’re hiding Poppy’s killer, a.k.a. Henry, Hope’s newly formed teenage hybrid. You see, Marcel only has two rules. Number one: He doesn’t kill vampires. So, Henry will only get a slap on the wrist for his crime. Number two: He doesn’t hurt kids. He’ll just starve them, isolate them, and punish them by caging them in cement and brick. Easy! A few years and Henry will be a free man. . . maybe even sooner. In the quarter, Vincent and Freya meet up to talk about the ramifications of Klaus’ detour through Louisiana. Vincent knew blood raining down from the sky was not normal, no matter what the weather man told him. Freya suggests Vincent meet up with The Oracle to uncover what the future might hold for the citizens of New Orleans. Freya alludes to the fact that after The Oracle is done reading his palm, he might palm something else. Naughty, girl! Vincent is going to need a lot of whiskey for this discussion. The Oracle is hesitant to give Vincent the answers he desires, but Vincent pleads with The Oracle for guidance. She is the most gifted seer in New Orleans. “When I ask the earth a question, I can taste its truth on my tongue.” Disturbing image aside, The Oracle gives Vincent some rather startling news. All this time he thought Klaus would be the one to destroy his home. Alas, there is someone even more powerful, someone he definitely should be afraid of. Hope. She is going to cast some serious bad voodoo. Her magic is dark. Her magic is endless. Any chance there is for peace and sunshine will be obliterated by this young girl. Tragedy is imminent. The cards don’t lie. Vincent holds on to the idea that Hope can be a good witch and not a bad witch, despite the odds. Back at the Mikaelson compound, Roman is busy snooping around, investigating Klaus’ strange and interesting artifacts. He’s confused. Normal witches don’t live in a house of horror. What’s going on? Way too easily – attention from a cute boy will do it every time – Hope confesses. She isn’t your average witch. She is actually the daughter of Crescent Alpha, Hayley Marshall, and the legendary vampire, Klaus Mikaelson. She’s the daughter of an Original. Uh oh. Daddy Klaus is home. After getting – what I assume – was a very enlightening call from Marcel, Klaus reappears to confront Hope. There was no way Henry could have taken Hayley. Although, there didn’t seem to be any other suspects. So, who had the strength, let alone the ability to take down a supercharged hybrid like Hayley? I can think of one. Klaus is angry and astonished. Hope? Hope kidnapped her own mother? GASP! What can be the only logical explanation for a betrayal such as this? Hope smirks. This ruse, this farce, was all because Hayley wanted some attention. She wanted her father to come home and this was, to her, the way to do it. Girl, were you wrong. Furious, Klaus scolds his only daughter for her thoughtless action. Her intentions may have been good? But her actions were definitely bad. And familiar, maybe? Hope did learn from the best. Hope admits to reading Klaus’ memoirs and all the naughty things he’s done. In my opinion, reading Hope’s mind to unlock the location of Hayley’s sleeping corpse is not one of them. Klaus goes to retrieve his ex, but gives Hope this warning. The closer Klaus and Hope are, the worse things get. For example, you see that vase of flowers? Yeah, a snake just came slithering out of it. “Snakes. Why did it have to be snakes?” Oh, God. They’re everywhere! Klaus and Hope can not stay together, no matter how many tricks she tries. It’s impossible. Everyone is in danger. Keelin couldn’t care less, however. Back from overseas, Freya’s longtime lover questions the witch’s hesitation in leaving the city. Their plane leaves in a couple of hours, so Freya better make up her mind. At this point, Freya is unconcerned with the status of their relationship. Family comes first and whatnot. Freya knows she can not leave her family when they are in such dire need of her talents. She’s the witch on-call. Freya doesn’t want to be the reason Keelin is unable to pursue her dreams. She urges the werewolf to leave without her. “I can’t love you and my family at the same time.” Bulls**t! I can bulls**t. Freya, you’re an idiot. With Hayley’s location, Klaus and Freya pinpoint the werewolf’s hiding place. Only, she’s not there. Blood is everywhere and scratches mark the walls. Something happened here, something not very nice. Hayley is MIA. When Klaus relays the news to Hope, she is taken by surprise. She wrote the perfect spell. This shouldn’t have happened. Unable to take the shock, Hope shivers and shakes. She’s choking. [Warning, turn away if your easily squeamish] Hope is coughing up. . . a snake. Please, excuse me while I run away in terror. I might have blacked out at this point, but what I think happened next was Hope ordering Klaus to leave. He’s hazardous to her health. Forced to go back to Mystic Falls, Hope follows Roman into the night. Someone screams. Hope goes to see what’s the matter. There hangs Henry, heart ripped from his chest. Who killed him? Who let him out? We’ll find out next time on. . .
What did you think of Hope’s betrayal? Do you think her reasoning was good enough? Where is Hayley? Who killed Henry? How will Vincent help Hope become a good witch? Is Klaus a bad parent? Did Freya make the right decision? Tell me in the comments!